Craig, who was on his way home from working in San Diego. That first day we climbed at the Donnelly crag. 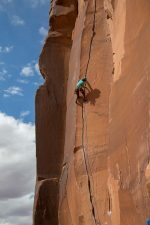 I tried to lead a 120 foot route called “Generic Crack”. The rack is one red, 9 yellows, two blues and a 4. I was fresh off a 24 hour drive on two hours of sleep…I bailed early. Craig and Daphney both led it clean. We also did the Cave route…or rather, they led it, while I took pictures. It was all reds, which is my worst size. My hands don’t fit in red cracks. I found out later that, for guys with big hands, learning to master reds is the hardest thing to learn at the creek. That was Saturday. Sunday we went back to Donnelly and climbed a few things we hadn’t got to the day before. She was super tired from on sighting 5.11’s the day before with Craig. We decided to take a rest afternoon. I offered to teach her how to oil paint. We each did a nice painting of this rode side buttress in the afternoon light. It was her first oil painting ever and she did a fabulous job! We both started with monochrome wash using Raw Umber. It’s a lot like using pencil, except it’s oil paint. You simply have to do a value study. I got bored with mine and broke out the color to make what you see here. 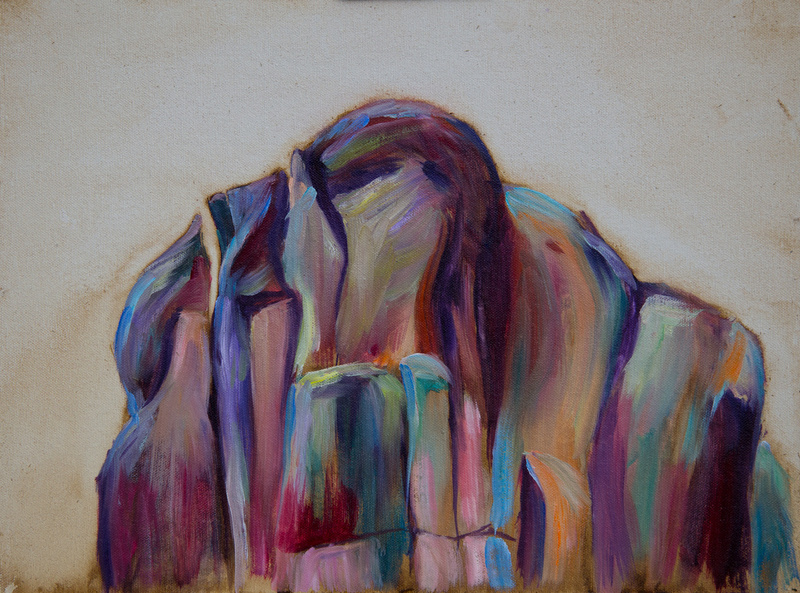 The light was flat…no cast shadows, so the painting turned out almost abstract. Normally I hate painting in flat light, but something about this little painting works. That night…might have been Sunday or Monday, it poured. We woke up to soaked sandstone and decided it was a good day to drive to town for some shopping and showers. We stopped by to see a hay bale house she had helped to build a couple years ago. It was a standard Ranch style house, one story, but the interior was all done by hand using hay and mixes of special mud. The floor was not concrete, it was mud mixed with hay. You aren’t supposed to ever mop it. The owner can’t hang pictures on the walls with nails because the walls are hay bales covered with 2 inches of adobe plaster. I heard that this style of home construction can outlast standard buildings. We still had time to kill before some of her other friends got off work so we hiked up to the North Fork of Mill Creek where there is a cool waterfall. There were some folks with a couple slack lines, but we ignored them as we set up our easels to paint. I decided to do this one with palette knife. It was once again flat light, even raining a little bit but we found an overhang under which to paint. I was fully expecting this one to bomb. I still don’t know what to think of it, but it feels very fresh and lively. I use instagram to reach out to other like minded artists. 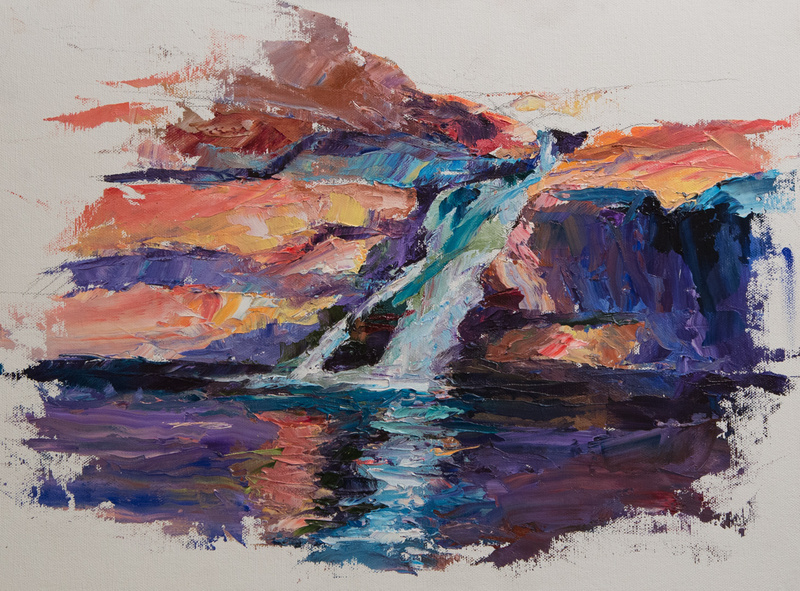 When I posted this little waterfall, I was shocked to see it rack up more “likes” than any other painting I’ve ever posted. We hung out with Ranger M and his girlfriend J when we were in town on a rain day. My favorite route was “where’s carruthers”. It’s a 10+ left of Scarface that I led clean after following on top rope. As Daphney said, “Learning to accept top ropes when they are offered is part of how you become a creek climber”. I did 4 paintings down there, all in a three day period where the rains came in at night. 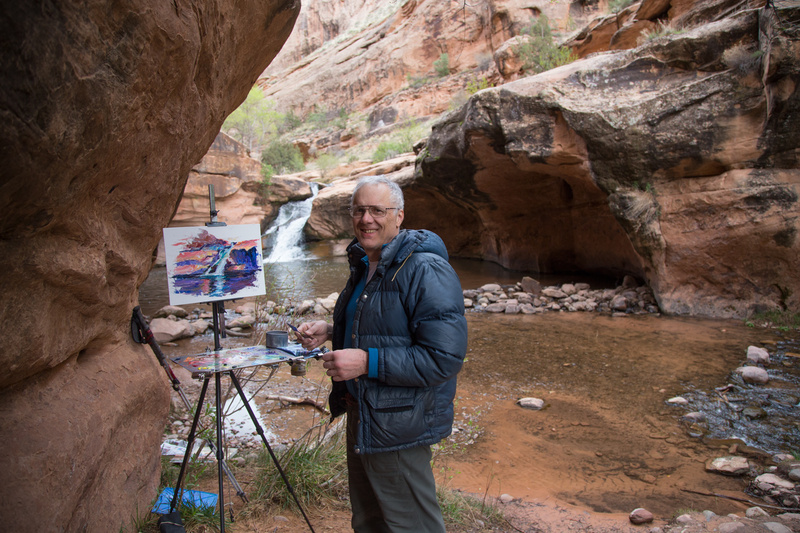 We drove to town, and I painted a waterfall up a canyon outside of Moab. When we woke up, I was ready to climb, but she said the rock needed another day. 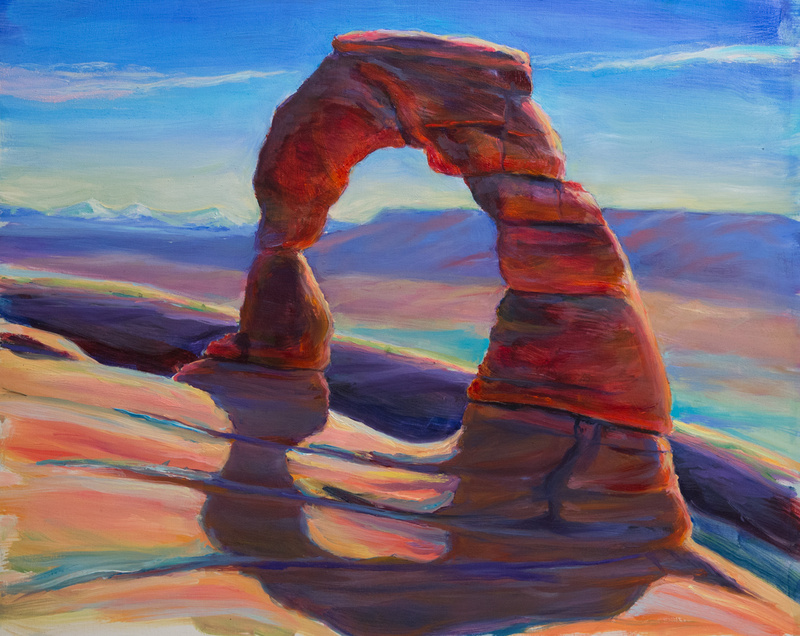 When I found out Delicate Arch was half an hour away, she went hiking and I went painting. I did two paintings that day. I’ve had the first one on my easel for the last few days. I’m trying to bring it to life. A lot of people liked it, perhaps more than any other painting I’ve done plein air. But I didn’t like it. I felt it was weak in many places. I’ve been slowly building in beauty, but it’s such a delicate process. The light is extremely tricky. It’s all reflected reds and tans. I’m trying to work from the photos I took as I did the plein air work…but I really miss the real light. Cameras don’t capture what I need, so my colors end up being guesses. Still, I was guessing on location, and it’s good practice to work in the studio. Another cool route was mudslide 10+ over at Optimat0r wall. 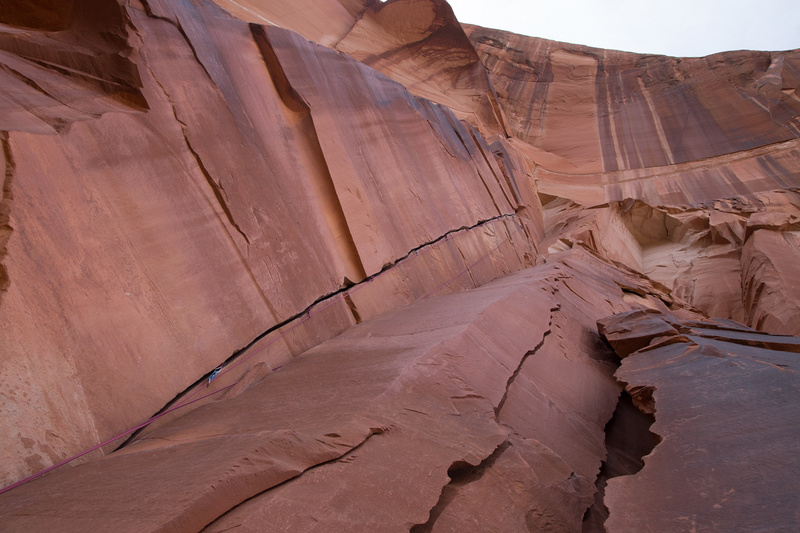 I followed D up Soulfire 5.11+: 130 feet of reds, capped by 3 greens near the anchor. I did quite well, only hung 3 times. I can’t wait to go back. 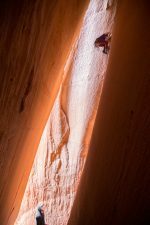 It is the best crack climbing area I’ve ever seen.